A month-old strike at South Africa's PGM mines shows no signs of being resolved. 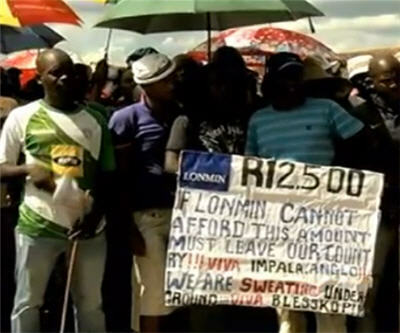 More than 70,000 workers at the world's three largest platinum producers, Anglo American Platinum (LON:AAL), Imapala Platinumm (OTCMKTS:IMPUY) and Lonmin (LON:LMI), have been on strike since January. "We are prepared to see it through," AMCU President Joseph Mathunjwa said. "When asked how long they were prepared to strike, Mathunjwa said: "Until we achieve a settlement.". Together the South African companies' mines produce 3.5 million ounces in 2012; almost 60% of the world's platinum. South Africa together with Russia control more than three-quarters of world supply. Estimates point to roughly 10,000 ounces of platinum and 5,000 ounces of palladium production lost each day due to the strikes. Implats says if and when the strikers do return to work it would take up to three months to restart production with around 10% of its shaft considered unsafe due to cave-ins. Last week the company, number two producer behind Angloplat, said it can supply customers to end of March, but not beyond. If strikes continue into May, the mines may need to source metal from the open market, or fail to deliver on contracts according to a research note by Standard Bank. Huge inventories built up at the largest producers and in Nymex warehouses are being blamed for the muted reaction of platinum and palladium prices to the disruption. The spot platinum price on Nymex in New York rose on Friday to trade at $1,429.60, that's down over 2% since the strike began. The price of palladium, last trading at $739.90 has lost $7 an ounce over the last month.